It is — without a doubt — the biggest missed opportunity for nearly every content marketer. Real growth is driven with intentional promotion, not just great writing. ... and still hear crickets? If you're tired of working hard for a few hundred pageviews, it's time to get serious about content promtion. 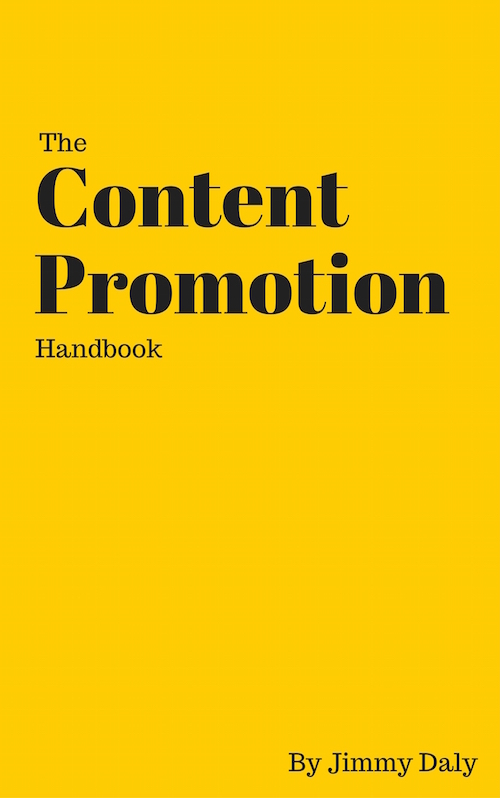 This book dispells the myths and misconceptions about promotion, and dives deep into actionable strategies you can start using right away. A focus on big wins and long-term success. Actionable strategies and template you can use immediately. A comprehensive guide to choosing keywords, writing effectively and getting attention. Interviews with some of the world's smartest content marketers. A book you'll keep handy for years to come. Jimmy Daly has spent the last six years creating and promoting content for Fortune 500 companies and startups. He is best-known for his work on the Vero blog, where he took an already successful blog and grew it 5x. He has been featured on Entrepreneur, Inc, Slate, The Washington Post, AllThingsD, The Huffington Post, MarketingProfs, Copyblogger, Backlinko, Sparksheet Buffer, Score, Unbounce and more. Use the form below to get notified when the book launches.